I was hoping that an attraction like this, would have a better road to drive on, like where you turn off the highway onto this gravel road...very bumpy etc, but besides that, it was fun, thanks! Looking for a activity that the whole family can do, this is it. We were short on time and this was perfect. It’s in a remote location, so we had a bit of a challenge getting back because we took an Uber there and could not find one to get back. Had to arrange another car service. Our cruise ship had an itinerary change beyond our control and all other tours didn't charge anything for the change. The jungle zipline tour charged me 40.00. 20.00 per person to change the day and would have been no refund to cancel altogether. Also made us feel awkward leaving the tour midway since they put us with the 7 zipline tour group and we were only 4 ziplines. They just told us we had to leave and to go through the bushes and find our way back to the office. The workers also weren't friendly from the beginning. I won't do this tour again! By far, one of the best Zipline experiences we had. Jungle Zip line is easy to get to just a few miles past the town of Piai on the North Shore side of the island. The staff and guides were very helpful, fun and provided lots of interesting insight into the local environment. We rode on 7 Ziplines of various lengths weaving back and forth through the mountain side terrain via short hikes. It's a fun safe activity for the entire family for anyone with basic athletic ability including adolescents up to adventurous senior's. We were part of small group of 11 people so the whole experience went by quickly. Fun activity and great way to get out into the mountain forest. Owner very nice. The 2 guys guiding us during the tour very nice, very informative, and very patient with me as I was initially very scared. They also shared facts about plant life that surrounded us. The only thing I would add to this tour is to have longer distance zipline but for beginners and first-timers its perfect! This was my fourth experience Ziplining, and my girlfriend's first. We both thoroughly enjoyed the experience of flying through the tropical treetop. We took the 4 drop package due to time constraints with the Road to Hanna trip we had planned for the day, but I would recommend taking the 7 drop package if you have the time. So much fun! Great price and friendly staff. I didn't realize I was supposed to confirm and select an exact time. That would have been tough since we were in the middle of a cruise but the staff worked us in the schedule anyway and we had a great time! Loved this jungle zip line. Great environment. 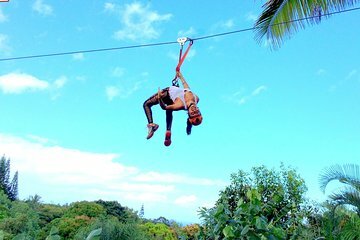 Researched the many zip line options in Maui and this one rose to the top. Right on! !